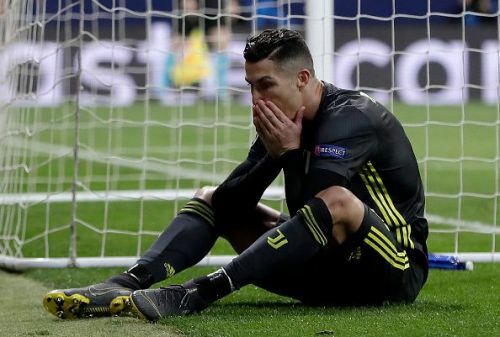 It was an entertaining game of football as Atletico Madrid beat Juventus 2-0 in their Champions League game at the Wanda Metropolitano Stadium. Both teams maintained excellent defensive shape in the first half of the game and didn't allow their opponents to have any clear sight of the goal. However, the game started to open up in the second half, and Alvaro Morata thought he had given his team the lead in the 73rd minute of the game, but his goal was subsequently denied by the referee, after taking the help of the video replays. Nevertheless, the Los Colchoneros keep on pushing and got the lead through Jose Gimenez in the 78th minute of the game, before Diego Godin doubled their advantage just seven minutes before the full-time whistle. Diego Simeone's troops controlled the game brilliantly after going two up and will go to Turin for the second leg with a two-goal advantage. The Italian side enjoyed 64% of possession during the game and took 14 shots, out of only 3 were on target, as compared to Atletico Madrid's 13. Juventus are currently at the top of the Serie A table, 13 points clear of Napoli. They are the only unbeaten side in Europe's top five leagues and are marching towards winning their eighth consecutive league title. They will play Bologna in the league next, before facing Napoli at the San Paolo Stadium on March 4. On the other hand, Atletico Madrid are currently second in the La Liga table, seven points behind the leaders Barcelona. They will play Villarreal at home next before making a trip to San Sebastián for playing Real Sociedad on March 3. Alvaro Morata scored against his former clubs, Real Madrid & Juve, in the last 10 days & started celebrating only for VAR to rule out both the goals. Name a more influential player in this season's Champions League. Juventus is giving Atletico Madrid 2 goal lead in Athleti's home?.